The Russian Empire, also called Imperial Russia, was a country which was located in Europe as well as Asia. It started in 1721 when Peter I of Russia proclaimed it. Before that, it was known as the Duchy of Moscow. It lasted until it was declared a republic in March 1917 after the Russian Revolution. It was an absolute monarchy ruled by Russian emperors known as "Tsars". They were members of the House of Romanov and believed that they had the divine right of kings over their people. In 1914, the Russian Empire covered an area of about 21,799,825 km². In 1897, it had a population of 128,200,000 (1897 year). Its official language was the Russian language. Its official church was the Russian Orthodox Church. Most people in Imperial Russia were peasants. They lived mainly in rural areas until the late 19th century when the Emancipation of the Serfs freed them from the farms where they had to stay. They were allowed to marry whomever they wanted, own property, and vote. A few people were nobility, also called boyars. They were educated and held higher prestige. Towards the end of the 19th century many of the educated wanted to remove the Tsar and give people more power. In 1917 World War I caused the bad conditions of people who worked in factories to become even worse with a food shortage, which people blamed on the Tsar. People rebelled and the cities such as St Petersburg and Moscow were faced with riots. The Tsar was soon forced to abdicate in the February Revolution in 1917. After the October Revolution he was assassinated with his family. In 1922 the Russian Empire became part of the Union of Soviet Socialist Republics, or USSR when a communist government took over. Some of the counties in the Empire escaped but the biggest ones were forced into the USSR. Peter the Great officially renamed the Tsardom of Russia the Russian Empire in 1721, and became its first emperor. He instituted the sweeping reforms and oversaw the transformation of Russia into a major European power. The Russian Empire in 1912. 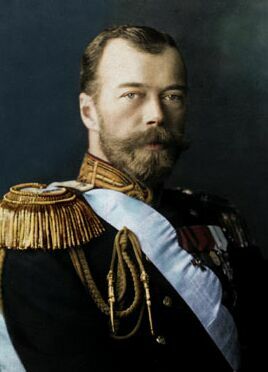 Nicholas II was the last Emperor of Russia, reigning from 1894 to 1917. An Imperial Russian Navy Brig "Mercury" Attacked by Two Turkish Ships in a scene from the Russo-Turkish War (1828–29) by Ivan Aivazovsky. Young Russian peasant women in front of traditional wooden house (ca. 1909 to 1915) taken by Prokudin-Gorskii. Russian Empire Facts for Kids. Kiddle Encyclopedia.